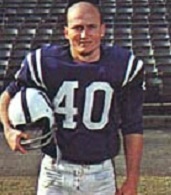 Boyd played quarterback as well as in the defensive backfield under legendary Head Coach Bud Wilkinson in college. Operating in a split-T offense, he passed for 653 yards and rushed for 960, scoring 10 touchdowns. Chosen by the Colts in the tenth round of the 1960 NFL draft, he was placed at left cornerback and excelled, intercepting 7 passes as a rookie. Boyd became a fixture at the position and, through his first four seasons, intercepted 19 passes. Colts went 12-2 to finish first in the NFL Western Conference while leading the league in sacks (57) and fewest points allowed (225). Lost NFL Championship to Cleveland Browns (27-0). Boyd followed up in 1965 by again intercepting 9 passes, this time leading the NFL, and added another in the Western Conference playoff loss to Green Bay. He played until 1968, a total of nine years (all with the Colts), and remained an outstanding performer to the end, intercepting 8 passes and garnering consensus first-team All-NFL honors in his final season. Boyd then retired to become an assistant coach for the Colts. Overall, he intercepted a franchise-record 57 passes that he returned for 994 yards and four touchdowns. He received consensus first-team All-NFL recognition twice, at least some first- or second-team All-NFL honors after three other seasons, and was selected to two Pro Bowls.